StoreHippo lets you to define groups of affiliates and assign groups to them. Grouping of affiliates allow you to perform certain operations on a set of affiliates. For example, to define different ledger rules for different affiliate groups. Go to Affiliates > Affiliate groups section in StoreHippo Admin Panel to access affiliate groups. 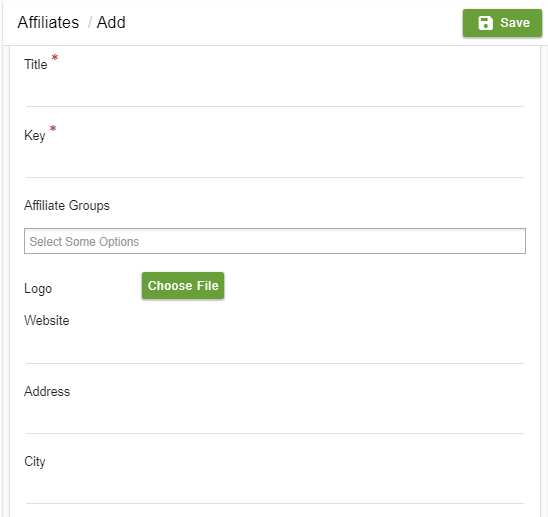 You can add the group in this section and then assign an affiliate to an affiliate group. You can add an affiliate group by clicking on the Add New button and fill the following form. Provide the name of the group. Alias is automatically created from the name of the group. Go to Affiliates > Affiliates section in StoreHippo Admin Panel. Add or edit an affiliate. Scroll down to Affiliate group field. Choose the affiliate group from the drop-down.